Updates and adventures from science educators/scobbers at Science Centre Singapore and the Science Centre OBservatory (SCOB). We are currently not maintaining our blog here. Please go to our Facebook Page for latest updates! Last night (14th August) was another great opportunity for planet watching, as Mars and Saturn lined up in the early evening with Spica, the brightest star in Virgo. Just as I arrived home, after a late event at Science Centre, I saw them peeking through a gap in the clouds. I only had a couple of minutes to snap a few shots before thick clouds covered them again. Over the course of the next month, all three objects will gradually get lower before finally disappearing below the horizon as Earth moves further and further away towards the other side of the Sun. As this happens, Mars will also move westward (upwards) away from Saturn and Spica. This alignment was due to how Earth, Mars and Saturn move around the Sun. 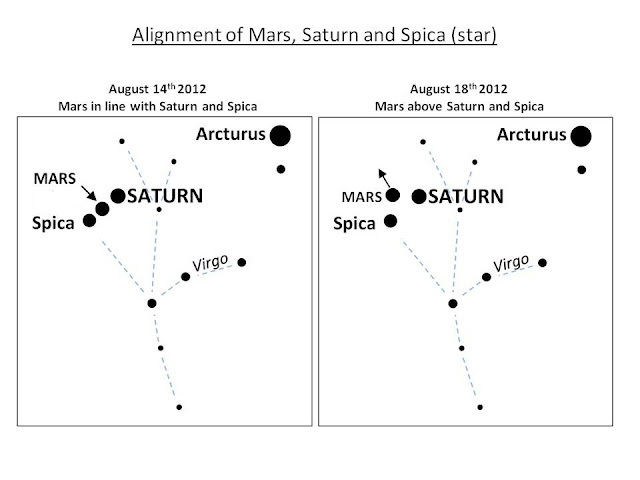 As seen from Earth, Mars and Saturn are currently directly in front of the more distant stars of Virgo. Earth and Mars orbit the Sun much faster than Saturn, which results in Mars appearing to move closer to Saturn before overtaking and finally moving away from the ringed planet. Here are the best months to see planets in the night sky this year (8pm-11pm). The Observatory is open every Friday evening from 7.45pm to 10pm. Admission is free! All visitors are welcome! The Observatory is located in Omnitheatre. Alight at Jurong East Station on the East West Line and walk or transfer to Bus No. 335.